Observed on trail-side vegetation in Kakamega Forest, Kenya. Oct. 2016. Length is around 5 mm. Katydids are largely nocturnal and most are very well camouflaged to hide effectively among the foliage of trees or shrubs. There are exceptions, however, with some having biologies that keep them active during the day. A color pattern that confuses insect-feeding birds would be one consequence of a day-active behavior. The extra black spots behind the true eyes of this species suggest a confusing trick. 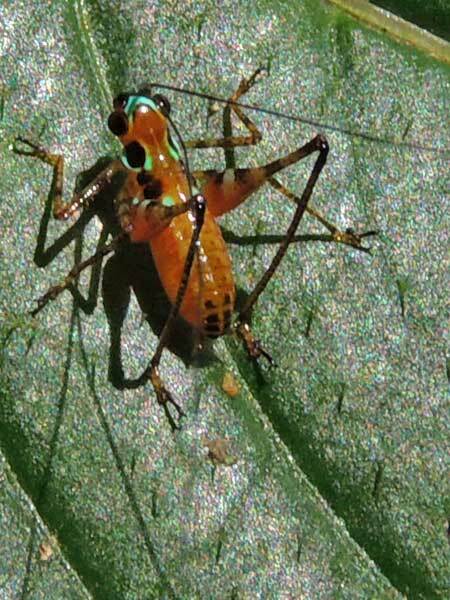 The colors of this small insect seem very un-insect like! Copyright Michael J. Plagens, page created 4 May 2017.